Paul LePage, the governor of Maine, has announced that he is considering ceasing state-funded support for methadone. As an alternative, Maine is proposing that patients prescribed methadone be switched to a more affordable suboxone option as part of a $727,000 state budget cut. The story is here. This is an indefensible decision with dire medical implications for opioid addicted patients currently receiving methadone. It equates to government officials making medical decisions that will negatively impact the health and well-being of thousands of people. Representative Drew Gattine (a member of the Health & Human Services Committee) is quoted as saying the proposal shows a lack of understanding of the societal costs of addiction throughout the state of Maine. Methadone and suboxone are both effective medications, but offer very unique characteristics and applications depending on the severity & chronicity of a patient’s opioid addiction. Buprenorphine (the actual opioid agonist contained in suboxone) has a much lower ceiling effect than does methadone meaning its effectiveness would be insufficient for a potentially large percentage of stable methadone patients on 60mg or more of methadone daily. Many patients on a moderate to high maintenance dose of methadone would not have their opioid withdrawal symptoms managed by even the maximum dosage allowed for suboxone – which is generally around 32 mg per day. For a politician to, in essence, prescribe inappropriate medical treatment for a diagnosable medical condition is a huge state liability. The repercussions are alarming. Hopefully, the local medical establishment and other state officials will step in before irreversible damage is done. Methadone works. This cannot be denied. Methadone has a long, proven track record of medical efficacy and cost effectiveness. 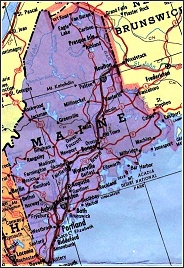 Maine, in particular, has suffered in recent years with a severe opioid addiction epidemic. Reducing access to appropriate medical treatment like methadone will likely result in overdose deaths across Maine and an explosion of condemnation for the governor and his office. Medication-assisted treatment (MAT) for opioid addiction is not a fad. It is scientifically proven effective and endorsed by multiple state & federal regulatory agencies as well as ASAM.